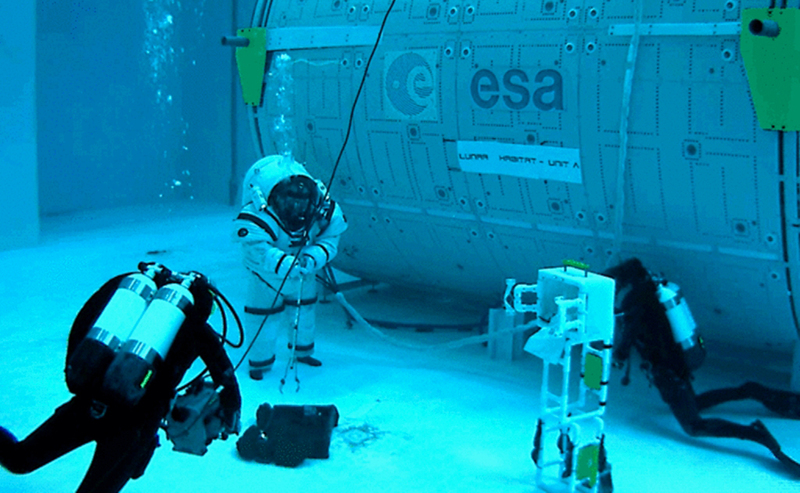 Space Applications Services as member of the Moondive consortium, recently concluded a study on how to adapt the NBF (large water pool at ESA/EAC - European Astronaut Centre) to conduct simulations of Lunar and Asteroid spacewalks. Space Applications Services as member of the Moondive consortium, recently concluded a study on how to adapt the NBF (large water pool at ESA/EAC – European Astronaut Centre) to conduct simulations of Lunar and Asteroid spacewalks. The partial gravity environment allowed by a combination of buoyancy and adequately sized weights provides an ideal way to train astronauts and study concepts of operations and tools before a future Lunar mission. The COMEX-led Moondive team included Space Applications Services, Space Diving Training and Support and Wyle GmbH. Space Applications Services was in charge of studying the tasks, hardware and operational requirements of future spacewalks, as well as designing an EVA Information System and robotics control concepts.